The most deluxe residential addition to South Melbourne’s leafy streets, The Evermore, has sold 50% of its apartments privately before even launching to market. 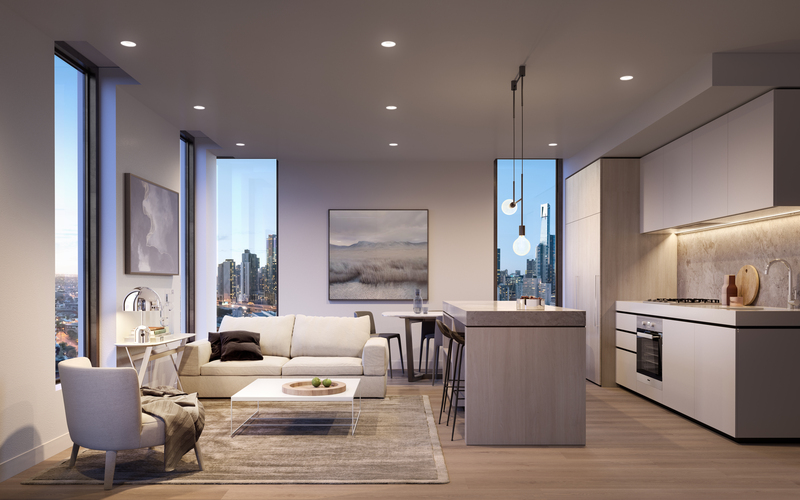 The success comes as a growing number of Melburnians are seeking beautiful, high-quality homes that offer the luxury of outstanding on-site amenities, all held within a premier and highly convenient address. As word spread that this dream lifestyle was being made possible through The Evermore, demand grew and apartments were quickly bought. The Evermore is a beautiful dual-tower structure crafted by internationally renowned Hayball Architects, composed of a creative combination of materials in champagne and copper tones. Now with less than half the properties remaining, The Evermore has launched to market, with the first public release focusing on the impressive one, two and three bedroom apartments with stunning interior appointments in the first tower. Despite the overwhelming demand in the pre-release phase, Developer Landence Group was keen to reserve some of the most prestigious properties for market launch. These high-end residences, so uniquely positioned in South Melbourne, have, as expected, garnered significant interest from local and overseas buyers. While the gorgeous corner apartments with expansive balconies and big views have attracted a certain clientele, that’s not to say The Evermore is reserved solely for the city’s millionaires. The competitively priced one bedroom apartments, which are currently on the market from $399,000, mark the relative affordability of the lifestyle offering – which includes the exclusive building perks on offer to residents. The building is designed to provide for a complete and fulfilled lifestyle for its residents, mimicking the range and quality of amenity of a 6-star hotel. The Evermore has both indoor and outdoor dining areas overlooking the manicured central courtyards, a lush podium-level garden, and a communal lounge space for relaxing. “It’s important that there are opportunities for the residents to meet and interact to create meaningful relationships. It is a vertical community which offers shared spaces as an extension of the home,” commented Bianca Hung, Senior Associate at Hayball.What a development can offer in terms of wellness is becoming increasingly important. As such, a range of wellness-focused luxuries has been carefully incorporated into the lifestyle offering at The Evermore, which boasts a fitness centre, swimming pool, sauna, cinema, and library. Because these incredible facilities are available to all residents, the market has responded extremely well to both the top end apartments as well as the smaller residences – all of which are expected to sell out soon. A large portion of the interest across the spectrum has come from locals who are familiar with the lifestyle value as well as the market value of a property so deliberately positioned between South Melbourne’s vibrant buzz, Southbank’s cultural richness and South Yarra’s catalogue of retail and dining. With Melbourne CBD just a few stops away by tram, or 15 minutes by foot, a city-orientated lifestyle is easily achievable. The Evermore boasts a walk score of 97 and a transit score of 100. Beside the urban connectivity, The Evermore is uniquely positioned to deliver a nature-infused and entirely relaxing lifestyle, with The Royal Botanic Gardens and Albert Park within walking distance. Positioned in the heart of Melbourne’s eclectic scene, yet surrounded by quiet and protected zones, The Evermore succeeds in delivering a distinct neighbourhood feel for its residents now and for evermore. Read more about The Evermore apartments or click here to enquire now.